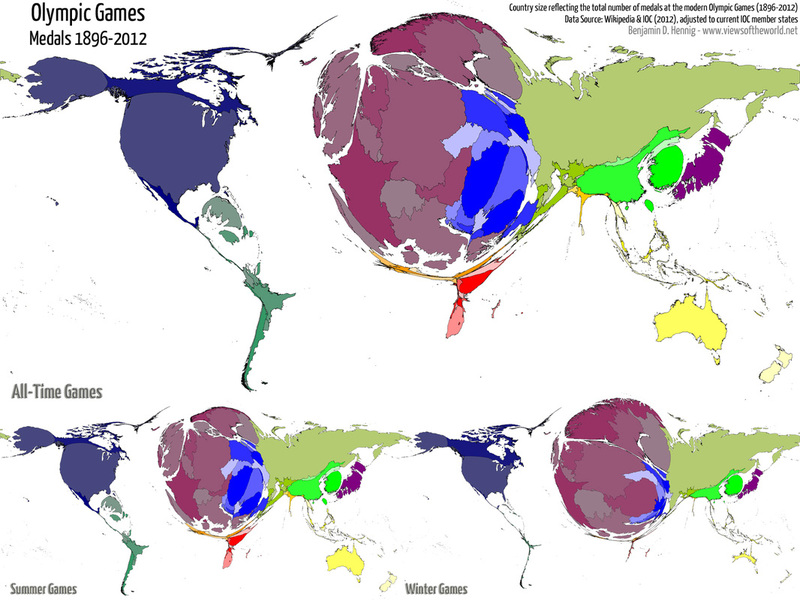 Starter Task: Open this map up that shows a map of the greatest sporting nations on earth. Also study the map above. Complete the tasks on the worksheet below. Other resources to complete the worksheet. 1. Click on this link that will take you to the most successful countries of all time. Task 1 - Study the BBC interactive article (above) carefully. You are going to be working as a group to determine the global participation spread of players in the Premier League. There were three prominent teams in the Premier League back in 2009. They were Manchester United FC and Arsenal FC, Chelsea FC. Each of these teams were successful and qualified for the UEFA Champions League, won cups and made millions of $'s in profits. i. Using the Task 1 worksheet above, complete the commentary for both maps of English Premier League participant players for 1989 and 2009. Task 2 - Click here to be taken to a graph that shows player participation in the English Premier League in 2014. Make a note of the data for each of the 40 home countries on a rough map sheet. i. Complete a choropleth mapping exercise to show the distribution of players from the countries in the last task. 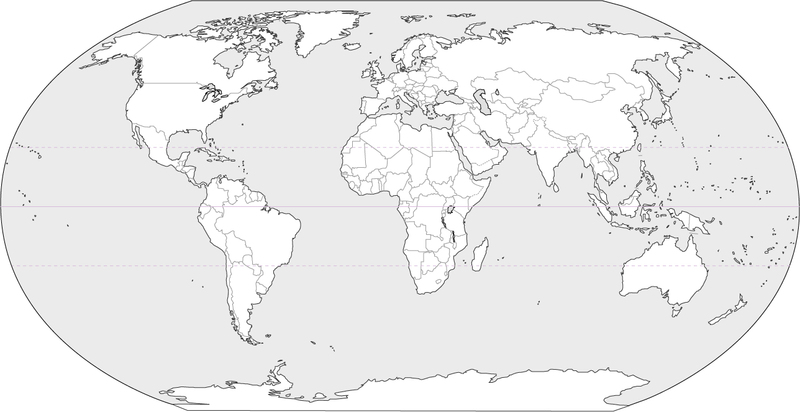 You need to leave countries with 0 participants blank and 45+ should be the darkest shading. Aim for 6 shade categories. ii. To do this, you will need a blank political map of the world (see above). Complete this task on both the global map (A3 sized) and Europe map (A4 size). Task 3. Using your own knowledge (HL from what you have learnt in the Global Interactions extension) and discussing with your group, try to construct flow arrows that explain why certain nationalities of players can participate in the Premier League competition. All of the following tasks can be completed on this A3 summary sheet. Task 4 - . Click here to access a news article on the UK Work Permit system and how it affects players wishing to participate in the league. Outline the rules for players who are from outside of the EU. Task 5 - . Click here to access a 2014 news article on the limiting of non-UK players in Premier League teams and promoting home grown players. Make notes on why this system has been introduced, how it links to the English National Football team and the effects that it is likely to have. Manchester City - Sheikh Mansour (United Arab Emirates). Wealth $4.3 billion with family fortune of $1 trillion! Manchester United - Glazier brothers (USA). Wealth $4 billion. 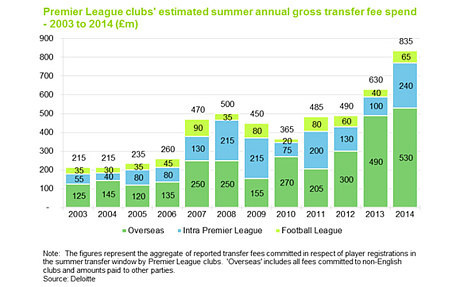 Check out the following articles to find out how much each club has spent to achieve success in the Premier League. 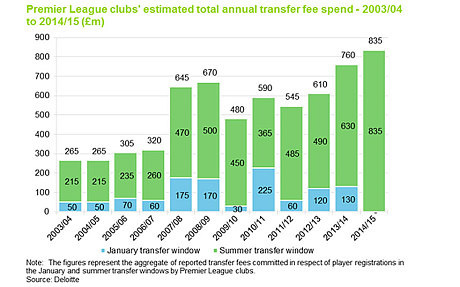 Make notes on these three clubs including levels of spending from the graphs below. Task 6 - Drag the timer bar to 5:33 on the YouTube video to the right hand side. Make notes on International Sports People from both the slide and the narrator. The majority of revenue for football clubs is generated not through fans who go to see live games, but those who watch matches live on television in different parts of the world. Click here to read the Independent newspaper article from 2010 on the money generated through TV broadcasting. Task 8 - . Using the information in the article, add the names of countries who have broadcast rights to your choropleth map and annotate how much each case study country paid for the 2012-2013 rights. 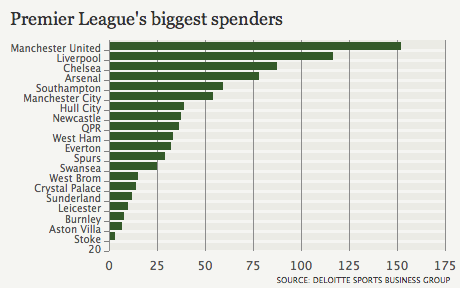 Where Do Manchester Utd's Sponsors Come From? Task 9 - Click here to access an October 2014 BBC news report on the cost of watching football in England. Add the title 'Price of Football: Ticket increases outstrip cost of living' and make notes on the key findings of the report and include at least ten different pieces of data. Task 10 - Click here to access another great bit of information from the BBC about the cost of match days at different clubs in the Premier League (and other English divisions). i. What are the top three clubs in terms of the most expensive season tickets (a ticket for all home games)? ii. What do you notice about these three clubs? Why might they be expensive for fans? iii. What are the cheapest three clubs in terms on the least expensive seasons tickets? iv. What do you notice about these three clubs? Why might they be less expensive for fans? Scroll down until you find the listings for the Spanish La Liga 2014-2015. Scroll back up to the English divisions. ii. In which division would you have to go in England to find a the cheapest season ticket that is as much as Barcelona's cheapest? Task 11 - Do you think the pricing structure for spectator participation in the English leagues is fair compared to other divisions in Europe? Why do so many fans continue to watch the game? Objective: Analyse the social, cultural, economic and political factors affecting participation and success in Formula 1 Grand Prix. ii. 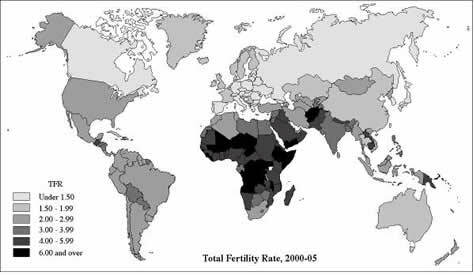 Highlight the current countries on the worksheet and comment on the spatial distribution in terms of MEDC/NIC/LEDC locations. Are there any patterns or any major omissions? iii.Name the five newest tracks and state their locations. iv. Which country has had the most Grand Prix circuits withdrawn? Task 2. Where the F1 drivers & constructors come from 2015 (Social). i. Create a simple chart that shows the birth place of F1 Drivers in the 2014 season by country. ii. Make a note of where the constructors (companies that build the car) come from and comment on the spatial pattern in the box provided on the A3 sheet. i. Using the Wikipedia entry for HDI values, note down the rank (scale of 0 - 1) of the country that has 'produced' the driver. ii. Annotate onto your graph on the A3 sheet the average HDI value of that continent. Add a key to show how HDI is measured. iii. Comment on the distribution of drivers and the HDI index. Which driver comes from the lowest placed HDI country? Has he been particularly successful in the sport? Task 4. Political factors affecting participation. Read the following BBC news article about the cancellation of the Bahrain F1 Grand Prix due to safety concerns after protests and uprising. IB key command terms Think....... For 10 marks, you will be required to write for about 20 minutes, so don't make the focus to narrow. Once you have your question ready, ask your teacher to double check the question. If it is suitable, use the 'IB Essay Writing Guide' and the IB marking grid to construct your answer. Fact Check - A brief history of the Olympic Games - here. Read page 1 of this PDF article and make notes. Starter - Watch the two videos to the right hand side. The first is a clip from the Olympic opening ceremony and the second from the closing ceremony. 1. What image was Britain and London trying to portray to the rest of the world? 2. How do they go about doing this? 3. Did you watch the opening ceremony? If so, what did you think? What were your reactions to it? 3. 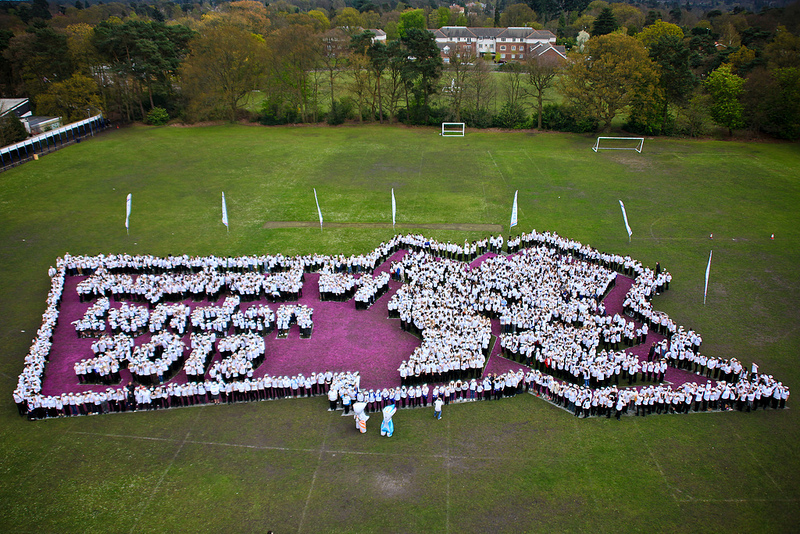 What do you think are the long term (months and years after the event) legacy of the games for London and the UK? Make a list in your workbooks and be prepared to explain why these could be classed as a legacy. When we talk about geographic factors, we generally refer to social, economic, environmental and political (SEEP). You will need a blank map of the United Kingdom and a blank map of Greater London. Click the button below to download ready to annotate copies. Task 1 - Use this link from the Telegraph and the YouTube video to the right to explore each of the venues for the London 2012 games. Those that are found in Greater London need to be annotated onto the London map. Those that were hosted elsewhere in the UK need to be annotated on the UK map. Task 2 - Use this map that shows the road infrastructure in the UK and copy the major motorways (in blue) onto your venues map. Then click here to access the main train networks in the UK. Make notes on the accessibility of venues outside of London, from London. Task 3 - Why choose London and in particular, Stratford in the east of the city? Click here to access further information and make notes in your book/Word document. 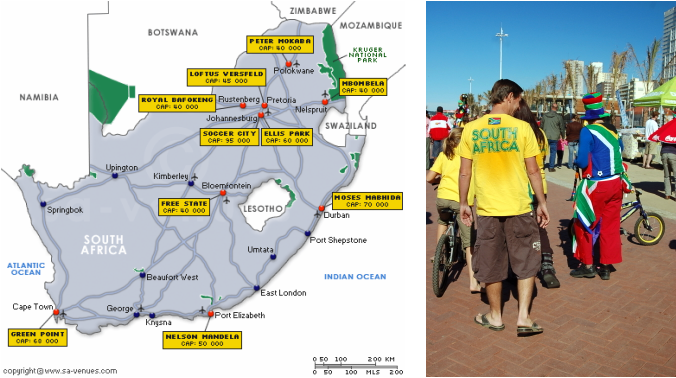 The video to the right will also help you to get a feel for the area prior to 2012. Take notes on why this part of London was chosen to host the Games in 2012. Your notes should include reference to jobs, space, infrastructure. 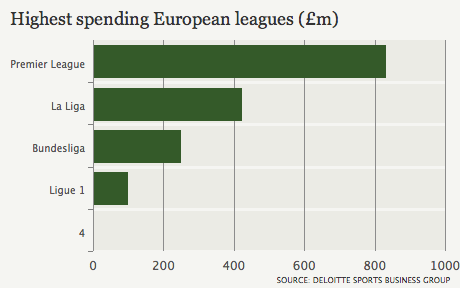 "Where is the Olympics money coming from - and where's it being spent? How much is coming from sponsorship - and how much does the Olympic stadium cost? Click on the the button below to see how it breaks down - and switch between the funding and spending with the button on the right"
On each of the two visualisations, you will need to click on the yellow "public spending" button to see where the public purse has contributed to the cost of the Olympic Games. Task 5 - Why is an MEDC economy such as the UK an important geographical factor when deciding on a host country? Consider the fact that the continent of Africa has never held an Olympic Games ceremony? Listen to what David Cameron (Prime Minister of the United Kingdom) says about the success of the Olympic Games in the YouTube video to the right. Task 6 - What does he mean about the "international charm offensive" right at the end of the video? Why is this important? How could it benefit Britain and affect the way in which the country is viewed internationally? Think about trade, tourism, the global recession, image, investment, partnerships, economic growth etc. IB Question - Analyse the most important geographic (SEEP) factors that influenced the hosting of the London 2012 games (6 marks). Objective 2 - Examine the factors affecting the sphere of influence for participants and supporters. Task 8 - Study the images on the right hand side carefully. Copy them onto a Word Doc and write a commentary underneath analysing the patterns outlined. Make reference to specific continents and countries and link to rates of success. Task 9 - Use this link to make a note of the 6 focus IB Geography countries and their level of success in the Olympics 2012. Wondering why Grenada suddenly appear in 2012 and you can't track them before this? Click here to find out. Task 11 - Explain how, when GDP and country size are continued, the medal tables shift in favour of very different countries. TOK Point - Should tables reflect population sizes and GDP? Surely, those countries with wealth and large populations will always outperform smaller poorer nations. Which Countries Are the Real Olympic Winners? Objective 3 - Evaluate the short and long-term geographic costs and benefits of hosting such an event at both the local and national level. Task 12 - Watch the two videos to the right and make a note of the local costs and benefits associated with bringing the Olympics to this part of London. Read this comprehensive PDF and take higher level notes on the expected SEE effects of the games. Task 14 - Complete some note taking regarding drawbacks of the London Games. Use the last video to the right, the four videos beneath and most importantly, the BBC information on the blue tab to the right to draw up a SEEP grid that shows the disadvantages. Watch the videos underneath and take notes on the perceived SEEP costs of the 2012 Games. You will need to have a copy of this worksheet to record down your notes on the impacts of the World Cup. Once you have been on the interactive tour, watch the video beneath (wait for the adverts to finish) and add more notes to your framework sheet. WORLD CUP SOCCER IN AFRICA: WHO REALLY WINS? cuts through the hype, with an uncompromising examination of what the World Cup means for South Africans themselves. International heavyweights like Archbishop Desmond Tutu, construction workers, FIFA's Communications Director, street traders, politicians, and sports celebrities, wade into the debate. National pride, corruption and even murder feature in this astonishingly candid film which peels back the glossy media veneer to expose the real concerns of ordinary South Africans.